After a pair of weekend wins over Yale and Brown, freshman goaltender Andrew Shortridge was named the ECAC Hockey Rookie of the Week as was announced by the league in a press release. Its the first career ECAC award for Shortridge, a native of Anchorage, Alaska who has given the Bobcats stability in goal in the second half of the season. This past weekend Shortridge combined for 37 saves in two wins with a 1.50 goals against average and a .925 save percentage. 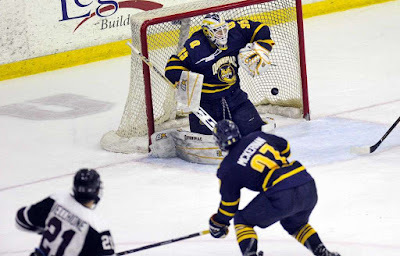 After starting the season 2-2 he is 7-3 in his last ten starts in goal for Quinnipiac. On the season Shortridge is 9-5 with a 2.16 goals against average and a .915 save percentage with one shutout which came against the Brown Bears in a 1-0 win back on February 3rd. The Bobcats are back in action as they take on the Brown Bears in a best of three first round series in the ECAC playoffs beginning Friday at the High Point Solutions Arena.